On CE routers configuration is simple. We use different area numbers on each end. PE route can run one OSPF process per VRF. Also redistribution between BGP and OSPF needs to be configured. You can control which type of LSA are redistributed into BGP. PE router also uses OSPF metric to set BGP MED attribute. It’s used in BGP path selection when two or more BGP routers advertise same prefix. 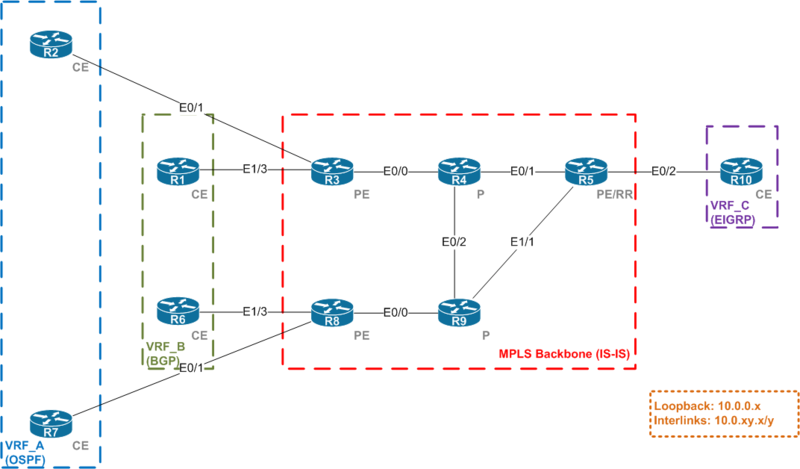 While redistributing back to OSPF the BGP MED is set back as OSPF metric. It can be overridden during redistribution using metric keyword or by default-metric under OSPF process. Other BGP extended attributes are used to carry OSPF characteristics. While redistributing from BGP we have to remember to use keyword subnets otherwise only classful networks will be redistributed. While redistributing from OSPF we have to match appropriate LSA types. We can check if the routes are properly propagated on CE router. We can see them as an OSPF inter area links with different metrics for loopback interface and CE-PE router.